I was born in Cairo, Egypt, near Midan El Tahrir, where the recent popular revolution in Egypt began. Question: How long have you lived in Israel? I began at the early age of seven. I was in an English School, “Alvernia English School for Girls” in Zamalek and was the only one in my French speaking family who wrote in English- It was my secret language in which I wrote my thoughts and poems. At the age of fifteen, I founded together with my Arab Egyptian friend Kadreya, a Poetry School Magazine, called “The Rainbow" – We had just emerged from the bombings of World War Two”, and the motto of our magazine was: “To Abolish Wars from the Earth Forever”. How naïve we were then! Question: How long have you been a member of Voices? Since the very beginning. I was one of the founding members. I was approached by Reuben Rose, when some of my poems were published in The Jerusalem Post. Question: What are the most important changes you’ve seen in Voices in all this time? I am glad to see that many new poets have joined, and that the quality of the poetry is improving. The new format of the Voices Newsletter on the Internet, by our new Secretary Helen Bar-Lev is artistic and very appealing. Feelings, deep thoughts. A real poet is a leader, one that tries to repair his world and society. I am inspired by themes of “peace” and “equality for women”. I often write on these topics, when they touch me deeply hoping to add a drop in the urgently needed ocean of “ repairs”, called in Hebrew “Tikkun Olam” (Repair the world). I prefer the open form. It gives the opportunity for more depth and intimacy. I also like the ballad form – its lyrical music is inspiring. My favorite poet in English is the British Peace Poet Wilfred Owen who wrote during the First World War, and was killed in the trenches at the age of 25. My favorite poet in Hebrew is Yehuda Amichai. I also very much like the Nobel Polish Poet Chimborska. I live in Nesher which is five minutes from Haifa, in the North of Israel. Question: Tell us a little about your family. My husband Prof. Haim Aharoni, died of a heart attack four years ago, Some of the poems I wrote in his memory are released in a disc called: “To Haim – To Life : LOVE POEMS. They are sung by singer Michal Tal and read by me with background music, in English and Hebrew. They have often been played on Kol Yisrael, the Israeli Broadcasting company. The poems can be heard and read on my Homepage. I have two children, Ariel a Medical Doctor - Gynecologist, at the Rothschild Hospital, and Talia, the Founder and Director of the Dorot College for Third Age. I have six wonderful grandchildren and 3 delightful great granddaughters. I am a writer, and a professor of English Literature, M. Phil from London University, and Ph.D from the Hebrew University in Jerusalem, on Nobel Laureate Saul Bellow. I have Taught at Haifa University and at the University of Pennsylvania. I am also a Sociologist and taught at the Technion in Haifa: “Conflict Resolution through Bridges of Culture. I have published 26 books to date, half of them on Poetry and Collections of Poems..
Below are the titles of some of them. You and I Can Change the World. "These fine and moving poems shine with deep and challenging truth s about life, relations between women and men, and above all, Ada Aharoni instills a vivid hope and vision of a Middle East and a world beyond war. Ada shrinks from no emotional, ethical or moral complexity. She is a marvelous poet". Woman: Creating a World Beyond War. A powerful collection of poems and prose, an eye-opener as to women's power to abolish war. At a time when the world is still caught up in the clutches of war, terror and violence, humankind should now "listen to women for a change." If the women of the world succeed to unite, they can powerfully throw the demonic belief that "wars and terror can solve conflicts," into the anachronistic dustbin of history.
" Ada Aharoni is a major universal poet and writer. 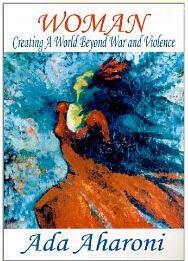 Her new book on women creating a world beyond war and violence, is a celebration!" ~(New Waves: New York ). Peace Flower. A lyrical story that will delight all, from the age of ten to a hundred and ten. 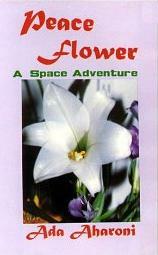 It is an imaginative tale of fantastic adventures in space, to find the Peace Flower in the Future and bring it back to earth as it does not yet exist in our Present. Lee and Roni, two brave children, face the terrible nuclear giant Nuki, who tries to stop them from bringing peace to the earth. Through their courage and love for each other, they finally triumph. This original and hopeful book has been adopted by schools and colleges all over the world. It is available in English, Hebrew, and Arabic. Not in Vain: An Extraordinary Life. Relates the remarkable story of Sister Thea Wolf, a German Jewish Nurse who came to work in the Jewish hospital in Alexandria, Egypt before the outbreak of World War 2. This not only saved her life but also thrust her in a leading role of helping Jewish refugees who came to Egypt in their attempt to escape the horrors of the Holocaust. The book contains moving poems that open each of the chapters of this unique biography. Also available in Hebrew, titled The Woman in White: Memories from Alexandria. For more information, please email Ada Aharoni. Thea Wolf (born in 1907) passed away on the 14th of April, 2005, in Frankfurt on Maine , at the hospital where she studied to become a nurse. From the Nile to the Jordan. 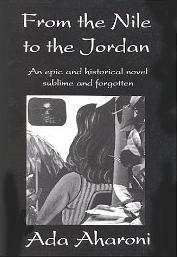 A compelling and colorful historical novel, which captures in detail the spirit, excitement and intrigue of mid-20th century Egypt and Israel . At the core of this stormy saga is Inbar Etty, the beautiful and talented daughter of respected judge Mosseri, member of Cairo 's Jewish community. When the storm of tragic events in the Middle East in 1948 threatens to destroy her future and that of her lover, the Holocaust survivor Raoul Lipsky, she sets out in a passionate quest for roots, love, fulfilment, creativity, and a new home. French Edition: Du Nil au Jourdain. "Beautiful, heroic and fascinating! 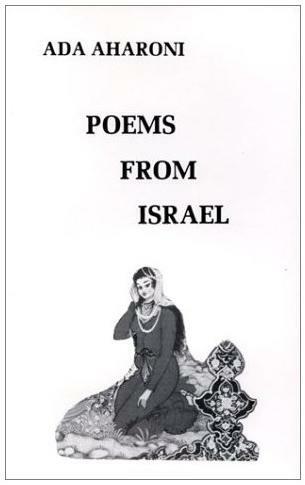 The book divulges a whole epic saga that is a part of history which is still quite unknown..."
Poems From Israel. "This is a fascinating book, sensitive and moving, covering a wide range of subjects, and above all ex press ing a deep yearning for peace in the Middle East ." Waves of Peace - Galim 8. 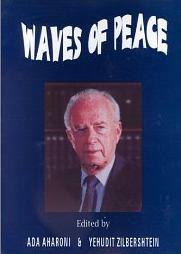 A collection of articles, poems, and pictures to commemorate the peace leader Yitzhak Rabin. It also contains some of Rabin's own speeches, as well as quotations. New Waves Galim 2000. 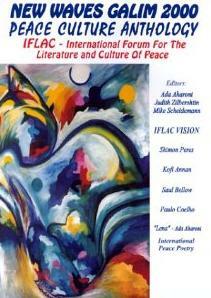 "Peace Culture Anthology" in English and Hebrew, and some Arabic. 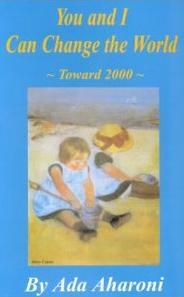 It includes poetry, and an interview with Nobel Laureate Saul Bellow, Paulo Coelho's "Statutes" for 2000, articles on the significance of peace by Albert Einstein, Kofi Annan, Shimon Peres, Prof. Chaim Aharoni, and many others. It contains peace poetry by the best poets from 24 countries. 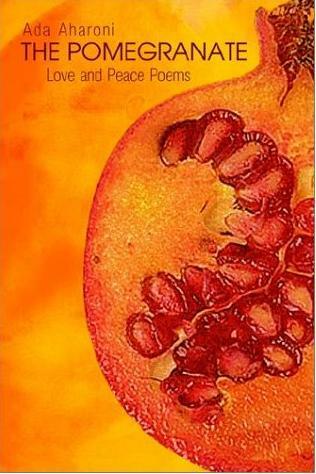 The Pomegranate: Love and Peace Poems. Like a fresh, fragrant mint branch. In the Ability Center in Khan Yunis, in Gaza. And we became new friends. With women it is as easy as that. You gently asked: "Which one do you like best?" And in my poetry presentations. My new friend in Gaza. With women it is as natural, as easy as that. You, the greatest murderer of them all. Raise up their hands and look up to the sky. Like a corpse - but still warm, still alive. I was born in Cairo, Egypt, near Midan El Tahrir, where the recent popular revolution in Egypt began. I have lived in Israel since 1950. I live in Nesher which is five minutes from Haifa, in the North of Israel. I have two children, Ariel a Medical Doctor - Gynecologist, at the Rothschild Hospital, and Talia, the Founder and Director of the Dorot College for Third Age. I have six wonderful grandchildren and 3 delightful great granddaughters. My husband Prof. Haim Aharoni, died of a heart attack four years ago. This is Ada Aharoni's first appearance in Sketchbook.